Rabbit AFL (KelinciJenis Ras AFL) have feature : Flat face, Massive head, Well filled wide muzzle, Ears hang straight down, -Lots of width between the eyes, Lots of width across the top of head, Lots of width across forehead, Lots of width across the eyes, Well filled muzzle. 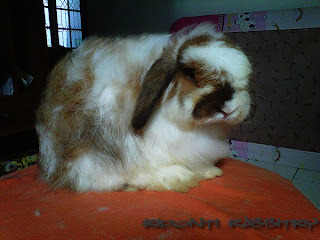 Under the Head (Kepala) section of the Fuzzy Lop Standards it does say that at the base of the head there should be good width, and continue down with good width between the eyes. A Fuzzy lops ears are supposed to be thick, flat, wide, well-rounded , covered in regular fur ears, ear base (top of ear) should be slightly flattened, in proportioned to the rabbit's head (Hooters still needs to grow in to them). They should displaying a length between ½ to 1 inch below the jaw line and no ear control when relaxed. In the fuzzy lop standards under EAR Faults; It says the crown should not be slipped. Therefore without actually saying it, the ears should be positioned right behind the eye. Space between the eye and ear is considered a sign of a slipped crown. Jual Kelinci, Jual Pakan Khusus Kelinci DLL.